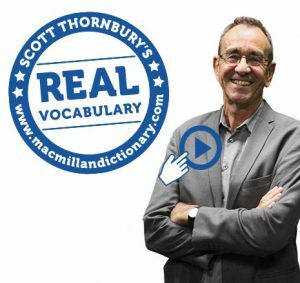 Welcome to our new series on Real Vocabulary, which kicks off with a quiz and two videos with Scott Thornbury. We decided to move the debate on from grammar to vocabulary because so many of the points of usage which traditionalists criticize relate to vocabulary and word choice rather than to grammar. For “prescriptive” grammarians – who believe that language is governed by strict and unchanging rules handed down by experts – almost anything seen as wrong is lumped together under the heading “bad grammar”. This is what happened in last year’s Bad Grammar Awards in the UK, where as many as four of the six nominations featured errors in spelling or punctuation – which is not at all the same thing as grammar. Even the “winning” entry – a supermarket slogan saying “Same luxury, less lorries” – is not obviously a grammatical question. This confusion isn’t surprising. One of the main lessons we have learned from studying corpora, and the evidence they provide of language in use, is that grammar and vocabulary are not two separate and independent systems. Rather, they operate together to create meanings, and it is often impossible (and pointless) to distinguish between the two. Language is full of more or less ready-made “chunks”, and when we use common expressions like “of course”, “if I were you”, or “on the other hand”, we process them as complete units, rather than as several distinct words bolted together using the structural rules of grammar. Collocation is another aspect of language which illustrates this point. You can have a grammatical structure such as Verb+ Noun-object but the vocabulary items which can be combined in this way are often quite limited: when the noun object is the word crime, you can’t just put any old word meaning “to do” in the verb position: people don’t do or make or perform crimes, they commit them. In the Real Grammar series we discussed ten controversial points of English usage. It became clear from our analysis of the language data that thinking only in terms of “right” or “wrong” was not a helpful approach, because it oversimplifies complex issues. Features such as context, register, and regional variety can all affect the appropriacy of a particular use of language, so that something which is perfectly acceptable in one context may be very inappropriate in another. It isn’t “wrong” to use the word jammy when you’re talking about someone who is very lucky, but this isn’t a word that would be suitable in all circumstances. This is why the Macmillan Dictionary attaches what we call “labels” at words which are mainly used in certain limited contexts. In the case of jammy, there are two labels: “British” and “very informal”, which tell you that this would be an inappropriate word to use either in a more formal context – a court of law, for example, or a job interview – or if you are talking to speakers of other varieties of English. There are still some traditionalists who object to what they call the “modern” meaning of hopefully – where it is used to talk about what we hope will happen: Hopefully, the weather will be better tomorrow. (There’s an excellent post about it from Stan Carey.) To the British journalist Simon Heffer, who has written extensively about English usage, this is simply “wrong” and would only be used by “a barbarous writer”. This is a good example of a usage where grammar and vocabulary collide. In this case, hopefully is functioning as a “sentence adverb” – an adverb which affects the meaning of the whole sentence (rather than just applying to a nearby verb or adjective). Now, sentence adverbs are very common in English (we use words like sadly, thankfully, and unfortunately in exactly the same way), and this use of hopefully – which has been around for 50 years or so – would have developed by analogy with other sentence adverbs. And this grammatical argument is backed up by the evidence of usage, with corpus data showing that – in current English – the sentence-adverb use of hopefully is something like ten times as frequent as its original use as a “manner adverb” (as in “ ‘Do you think he might change his mind?’, she asked hopefully”). Sentence-adverb hopefully, in other words, has gone from being a novelty (half a century ago) to become a “norm” of English which is used across many different text-types, and which most people have stopped even noticing. There is absolutely no rational argument for saying that this use of hopefully is “incorrect” (still less, “barbarous”). In our new series on Real Vocabulary, we will adopt the same evidence-based approach we applied to questions of grammar. As with the previous series, Real Vocabulary will look at ten points of usage which are frequently criticized by language traditionalists, and we will evaluate these claims by reference to the evidence of language in use: we will discover the norms of usage by observing how people use words when they communicate with one another. As part of the Real Vocabulary series, we’ll be bringing you a variety of blog posts and videos over the coming months. You can also follow this topic using #realvocabulary on Twitter. Remember, too, that you can find all our earlier blog posts on this topic (and on Real Grammar) by using the tags “prescriptivism” or “realvocabulary”. Congratulations Scott for this new blog. I have learnt and opened my mind to the evolution of English in these past decades. Extraordinary research!! !